To read more please visit their web site, and also the Project Healing Waters facebook page. Fly tying is a central focus of our Project Healing Waters program here at Quantico USMCB and Ft. Bevior. Your web-site has been very useful to us. Your photos are excellent and your recipes are straightforward. Thank you for providing such a useful training aid to our wounded and injured Soldiers, Marines and disabled veterans. This photo is a plaque that was recently presented by us Quantico volunteer to a retiring Marine member of our fly tying program. The fly bodies represent the ribbon colors of each one of this highly decorated Marine’s personal awards, including the Bronze Star and the Marine Combat Medal. It is not too far a stretch to say that your fly tying was the inspiration behind choosing traditional wet flies for this presentation. 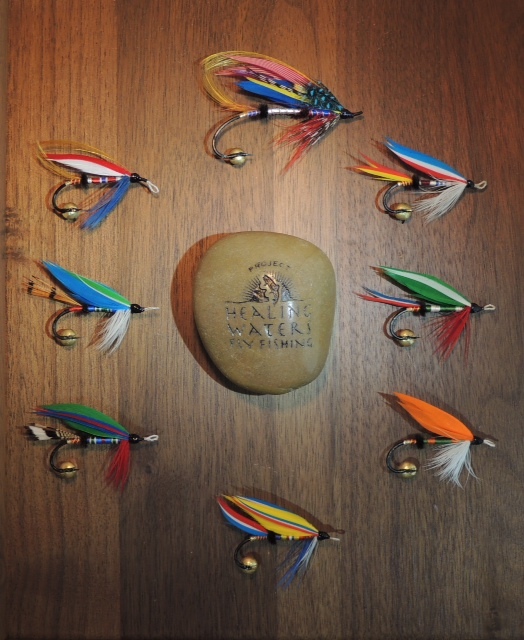 Project Healing Waters Fly Fishing Inc, presentation award frame of classic wet flies, the designs were inspired by the colors of US Marine Corps Medals. The individual fly tiers are unknown. Thank you to Jim Ottevaere and his crew of volunteers at Quantico USMCB and Ft. Bevoir for their dedication and devotion to project Healing Waters Fly Fishing, Inc. This entry was posted in Wet Fly Photos and tagged Project Healing Waters Fly Fishing Inc. Thank you Don, for sharing this. This is exceptional stuff, no doubt about it. The flies are outstanding, as well as the photo. Project Healing Waters is a wonderful group. I am glad they found your website. I am also happy to hear, they let you know that your site, has been a tremendous help to them. I know you are a veteran as well, thank you for your service! And as always your support and comments here are very much appreciated! Thank you! I really like this one…as I am a marine as well, ’83-’93, Gulf War, Somalia. Thank you for your comment, and especially, thank you so much for your service to our country. I am grateful, thanks again! Don, two comments if I may. 1) I see that these flies were inspired by Marine medals. I suggest that they be named and captured as recipes for other tiers. 2) I will visit the website but if you want to pass my name on to any service members in the Western NY region I would be happy to share whatever fishing locations and stuff I have. That’s a good idea. I’m not sure we can get the information or not. I wait a few days to see if Jim Ottevaere sees this and replies; otherwise I can make that request via e-mail. Thanks for your offer to help any disabled veterans in the Rochester, New York area. Any word back on the naming and recipes for these flies? I sent John a direct e-mail, but have not heard back from him. I’ve been too busy to follow up on it, just completed several fly orders, one that was quite large. Still have more tying order irons in the fire. Perhaps I’ll check back with him. Thanks for your interest. Hi Don, and Happy New Year. May this one bring you fine fish and sunny days. I was just fumbling around some old bookmarks and saw this post of yours and remember how moved I was that this organization exists. I’m still interested in whether or not they wrote up the recipe’s. If they ever do I’ll place an order and then donate an equal amount. I did e-mail Jim at Project Healing Waters but never heard back from him. I’ll try to contact him again. And I’ll also e-mail you, I have another idea…thanks for your interest and comments! These flies are superb (as usual) Don and Healing Waters is such a worthy project to tie for! We need to recognize the huge contribution of all of our veterans–war and peacetime–and make sure they are properly cared for in hospitals, clinics, and in job opportunities and programs! Thank you for your comment and appreciation of the flies! For the record, because it’s not clear to me in your reply, these flies were tied by disabled veterans at Quantico, I did not tie them. I agree with your support of veterans. Massachusetts tier and veteran (Viet Nam I believe) Dave Benoit is one that has devoted a lot of tying energy and creativity to patterns for the military. I believe he has a Purple Heart fly…check him out at next year’s Fly Fishing Show in Marlborough. Thanks again!